Uc123.com – How to remove? Uc123.com is a website that might make many troubles for you. Evidently, it is aimed at Asian users, but you might definitely discover it set on your browsers too. If this browser hijacker is inside the system, you will see Uc123.com set as your New Tab, homepage, and search tool. 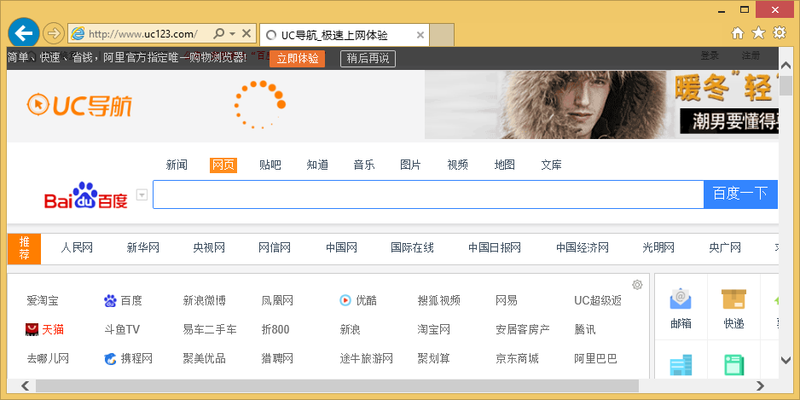 Many users, especially those who do not know any Asian language, find its presence very annoying because they do not know what it is written on it, and they cannot delete Uc123.com to set a new website. Do not worry if you have encountered the same problem because we will tell you how to uninstall Uc123.com from your browsers today. Before you go to implement the Uc123.com removal, you should read this article to find out more about this browser hijacker. If you are not interested in the information about this threat, you should skip to the last paragraph. It will thoroughly explain how to remove Uc123.com from browsers, i.e. get rid of this browser hijacker infection. If a browser hijacker is really inside your system, you will see your all browsers’ settings changed. To be more specific, Uc123.com will be opened for you every time you launch any of your browsers. The presence of this website is not only very annoying, but might also cause you a bunch of different problems. For example, if you do not delete Uc123.com soon and use it to search for the information on the web or click on links you find on its main page, you might eventually end up on an untrustworthy website. This website might even contain malicious software. Of course, this is not the only problem this website might cause to you. Specialists also say that it might be dangerous to keep Uc123.com because it might quickly violate the privacy too because it collects all kinds of information about people and then sends this information to its affiliates. During the sending process, this information might end up in the hands of bad people. If you do not wish this to happen, go to implement the Uc123.com removal right now. How did Uc123.com browser hijacker enter my computer? If you have not set Uc123.com willingly on your browsers, it is evident that it has entered the computer without permission. Browser hijackers and similar infections travel in software bundles together with freeware, so it is quite hard to notice that these threats are going to be installed and thus prevent them from entering the computer. The easiest way to protect the computer is to install security software, so we recommend doing that for you too. How can I remove Uc123.com? Uc123.com will disappear from your browsers after their reset if it does not install any extensions. Unfortunately, this happens sometimes. In such a case, it is not that easy to remove this website. Therefore, if resetting browsers does not work, you should scan your computer with a legitimate scanner (anti-malware or anti-spyware). The web is full of these tools but not all of them are reliable, so be careful.